There’s exciting news coming from Washington Square Condominium, which I’ll get to in a bit. 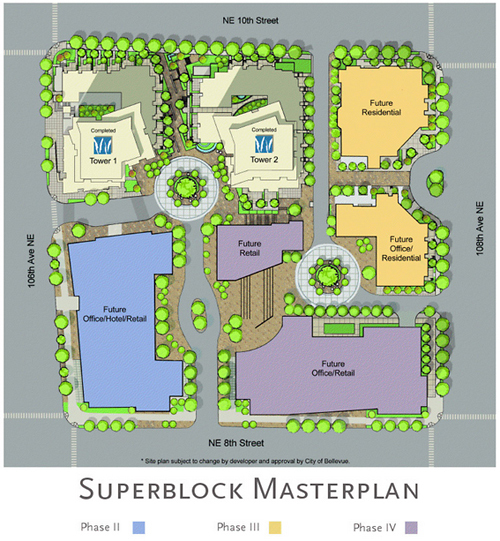 Washington Square is a significant super-block development in downtown Bellevue, just northeast of Bellevue Square. Presently, only the first phase of the project has been completed — the two 22-story condo towers with 377 residential units. The project is currently 66% sold, so there are still quite a few new homes to choose from. Washington Square Condominium features a variety of home styles, layout options and finishes from 667 square foot open one-bedrooms to spacious 3,400+ square foot three-bedroom townhomes. Amenities include concierge services, an owner’s lounge with a chef’s kitchen, a large fully equipped fitness center with spa and massage rooms, a billiards room and a dog park. Additionally, the townhomes feature private garages and personal elevators. The project is Fannie Mae and FHA approved and they’ve paid off their construction loan, so financing shouldn’t be a problem. There is, however, a challenge that potential and current owners are contending with…Washington Square has a number of owners in distressed situations. Of the 9 active listings 4 are short sales; all 6 of the properties currently in escrow are either short sales or bank-owned; and 13 of the 18 closed sales so far this year have been distressed properties. That is placing considerable pressure on values and is hampering the movement of the remaining developer units. 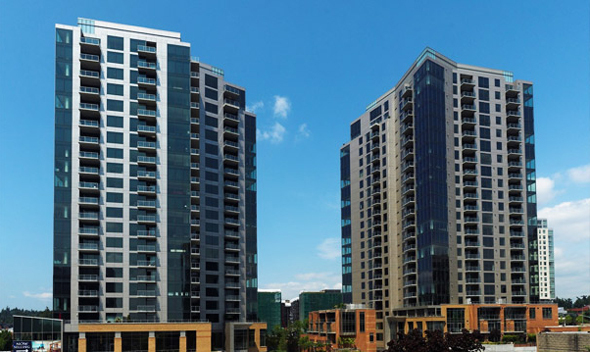 Washington Square has only closed 2 new units all year (based on NWMLS data – however, they have not reported all their sales to the NWMLS). For buyers, this can offer amazing opportunities, particularly with the foreclosed bank-owned properties, which have sold for up to 49% below their original sale prices back in 2008. That said, the residential towers comprise only a portion of the planned 10.5-acre superblock development, which will encompass retail, office, hotel and residential towers (think Lincoln Square & the Bravern). The developer expects the homes to gain value when the superblock is completed. It has the potential to be a vibrant and swanky urban village with restaurants, shops, entertainment and a neighborhood market. The exciting news is the additional phases, including a new condominium tower, are undergoing preliminary concept design. The developer anticipates starting the design review process with the city in early 2012 with groundbreaking late next year or early 2013. If those plans hold, this will likely be the first development of the next condo construction cycle. That would roughly translate to a late 2014 to 2015 completion date, by which time, the current Washington Square and Bellevue Towers inventory should be sold out.